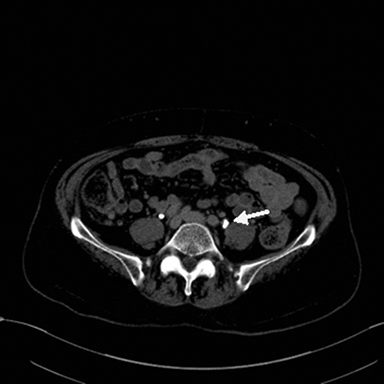 In 2005, a 74-year-old Indian male with a history of coronary artery disease, hyperlipidemia, and diabetes presented with left-sided flank pain without hematuria. The patient was a non-smoker and was on aspirin 81mg daily at home. Except for a mildly elevated blood glucose, his labs including comprehensive metabolic panel, complete blood count and coagulation studies (PT, PTT, and INR) were within normal limits. Urine cytology was negative for malignant cells. 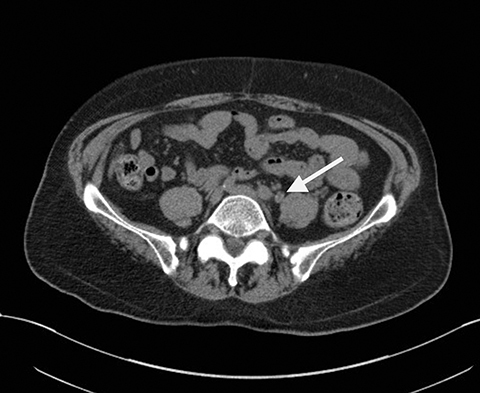 A noncontrast CT scan was ordered to evaluate for renal calculi but had revealed a left-sided, short segmental, mid-ureteral thickening with a punctate calcification and mild hydroureteronephrosis (Figure 1). 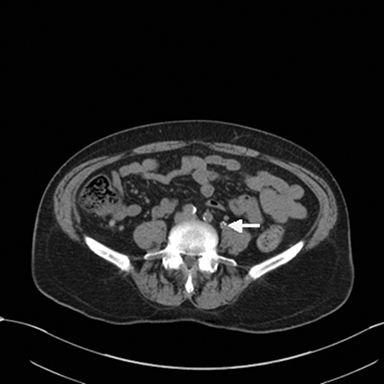 On a visit in 2013, the patient was evaluated with CT urogram without and with IV contrast (150cc IV iohexol 300, Figure 2). CT urogram without contrast demonstrated wall thickening with circumferential calcification of the middle left ureter with mild luminal narrowing without hydronephrosis. Corticomedullary phase did not depict an enhancing renal or ureteral mass. Excretory phase depicted a mild irregular wall thickening with no intraluminal filling defect. 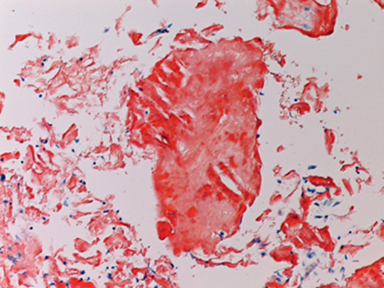 Cystoureteroscopic biopsy was subsequently performed and revealed abundant amorphous eosinophilic material consistent with amyloid. 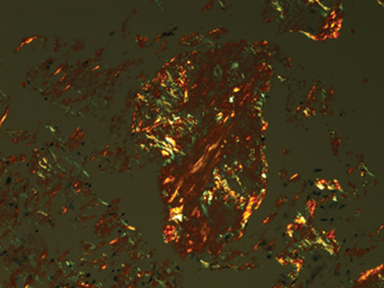 The presence of amyloid was confirmed by Congo red staining, showing apple-green birefringence under polarized light, as well as by a Thioflavin S stain under fluorescence microscopy, which was positive (Figure 3). Localized amyloidosis of the urinary tract is of clinical importance because it mimics urothelial carcinoma. Depending on the degree of disease involvement, patients may present with painless hematuria, irritative urinary symptoms, and obstructive symptoms.3,7 Although the cause of localized amyloidosis of the urinary tract is unknown, local monoclonal plasma cell infiltrates and local amyloid synthesis have been suggested as causes.3,7 Within the genitourinary tract, localized amyloidosis is commonly found in the prostate and seminal vesicles, but can also occur in the bladder, renal pelvis, ureter and urethra.5,9 Ultrasound, CT scans and MRI are often used as initial methods to evaluate patients with urinary tract amyloidosis. Localized amyloidosis of the urinary tract is rare and is difficult to differentiate from malignancy based on clinical and radiographic features alone. MRI findings of T2 weighted hypointense lesions may help distinguish amyloidosis from malignancy. Additional studies would help characterize the sensitivity and specificity for this study. Radiographic features of the other imaging modalities may be nonspecific, but it is important for clinicians and radiologists to be cognizant of this disease so proper management and treatment may be provided. Chitale S, Morsey M,Peat D,Webb R.Amyloidosis of lower genitourinary tract: a review. EAU-EBU Update Series. 2007;5:70-76. DeSouza MA, Rekhi B, Thyavihally YB, et al. Localized amyloidosis of the urinary bladder, clinically masquerading as bladder cancer. Indian J Pathol Microbiol. 2008;51:415-417. Ding X, Yan X, Ma X, et al. Localized amyloidosis of the ureter: A case report and literature review. Can Urol Assoc J. 2013;7(11-12):E764-E767. doi:10.5489/cuaj.576. Kawashima A, Alleman WG, Takahashi N, et al. Imaging evaluation of amyloidosis of the urinary tract and retroperitoneum. Radiographics. 2011;31:1569-1582. Zhou F, Lee P, Zhou M, Melamed J, Deng F-M. Primary localized amyloidosis of the urinary tract frequently mimics neoplasia: a clinicopathologic analysis of 11 cases. Am J Clin Exp Urol. 2014;2(1):71-75. Domiciano DS, De Carvalho JF. Primary localized amyloidosis of the ureter. Isr Med Assoc J. 2008;10:237-238. Tsujioka Y, Jinzaki M, Tanimoto A, et al.. Radiological findings of primary localized amyloidosis of the ureter. J Magn Reson Imaging. 2012;35:431-435. Weiwei Z, Yi H, Jinsong Z. Primary localized amyloidosis of the ureter. Abdom Imaging. 2011;36:609-611. Paidy S, Unold D, Catanzano TM. 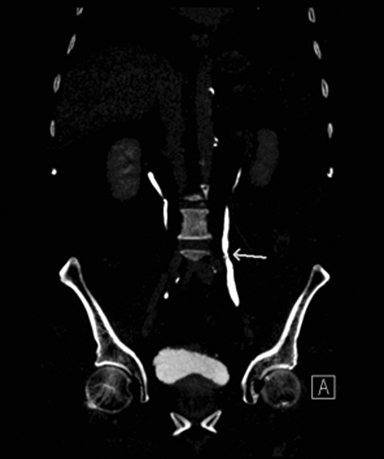 AIRP best cases in radiologic-pathologic correlation: localized amyloidosis of the renal pelvis. Radiographics. 2012;32:2025-2030. Borza T, Shah RB, Faerber GJ, Wolf JS. Localized amyloidosis of the upper urinary tract: a case series of three patients managed with reconstructive surgery or surveillance. J Endourol. 2010;24(4): 641–644. Raja K, Ahmed E, Mubarak M, et al. 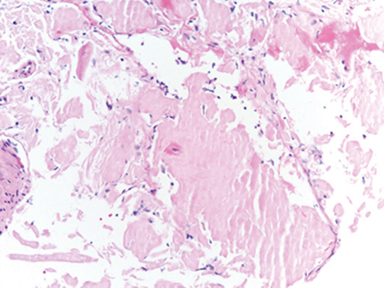 Primary Localized Amyloidosis of Urinary Bladder: A Case Report and Review of Literature. Nephrourol Mon. 2013;5(5):994-996. Ali ST, Shah S, MD, Przybycin C. Primary localized ureteral amyloidosis mimicking urothelial carcinoma. Appl Radiol. 2018;47(10):24-26. Prepared by Dr. Ali and Dr. Shah while practicing in the Department of Radiology, and Dr. Pryzybycin while practicing in the Department of Pathology, at the Cleveland Clinic, Cleveland, OH. The authors have no conflicts of interest to disclose.